May 5, 2015--I was privileged to give a class to the members of the ANG Delaware's Seashore Chapter on canvas drawn thread work. 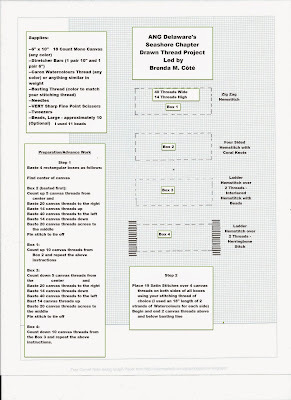 Below are the instructions I put together to do a simple four box project. If you would like to learn more about drawn thread work, please feel free to follow the lessons and send me your questions via the comment section at the end of this post. Have fun. 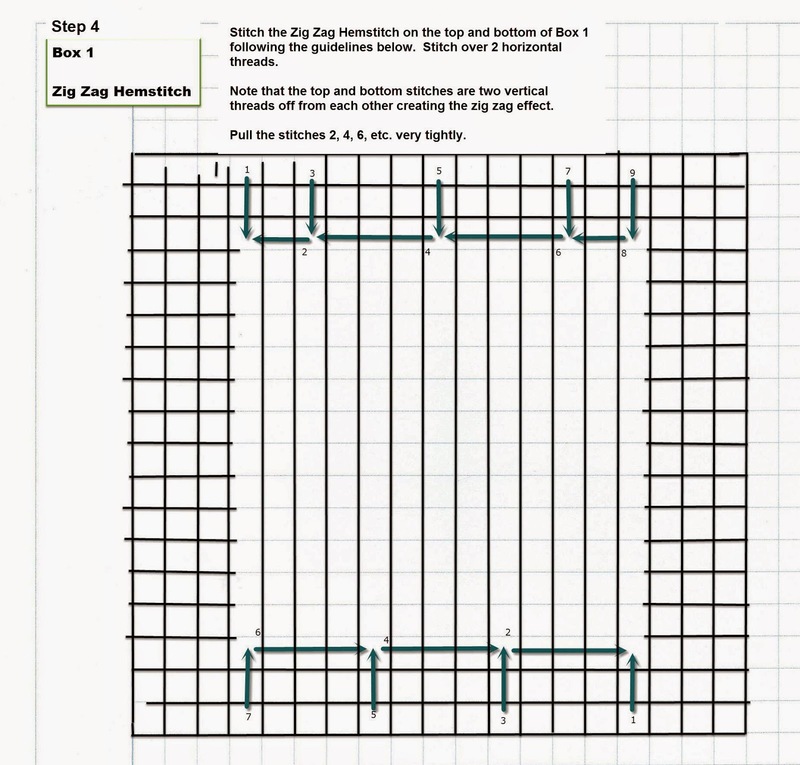 Step 3 - Drawing or pulling canvas threads from each of the four boxes. 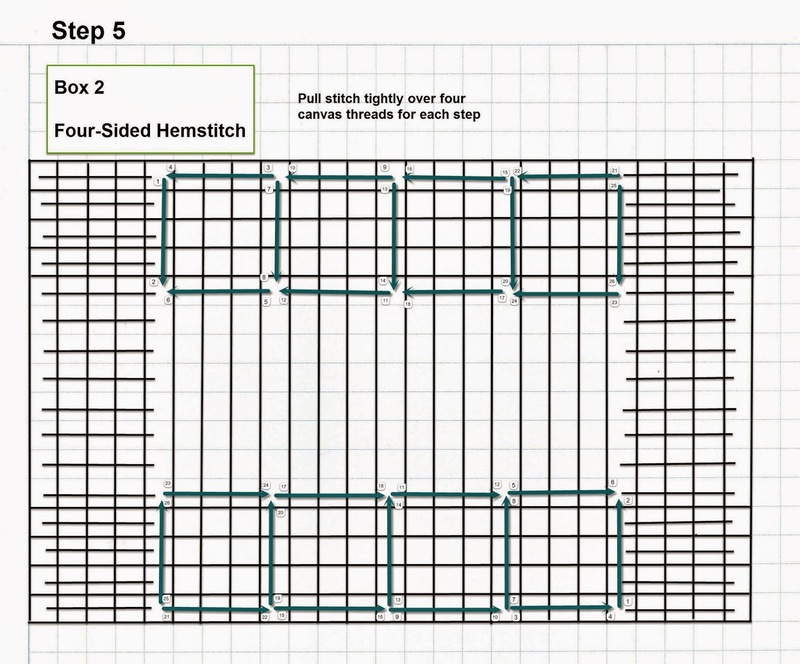 Begin with Box 1, clip 14 threads between the horizontal basting lines on both sides of Box 1. 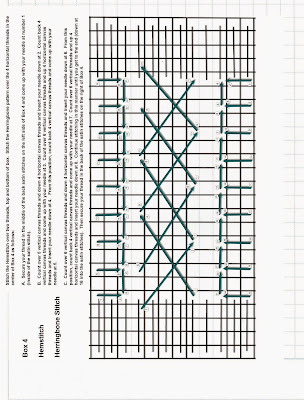 Move scissors as close to the satin stitches as possible. 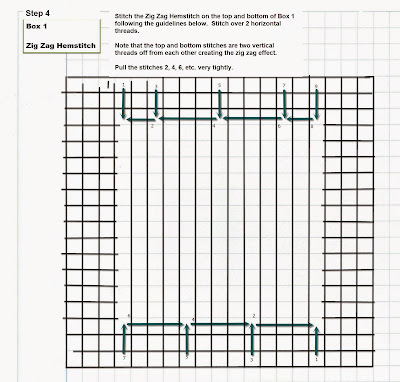 There will be two horizontal threads uncut on both the top and bottom of Box 1 for placement of the Zig Zag Hemstitch. 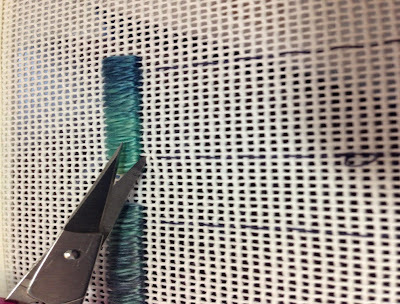 After cutting, begin to loosen each thread by pushing it down with a needle. This may be difficult because of the sizing or glue on the canvas which keeps it stiff. It gets easier as more threads are removed. 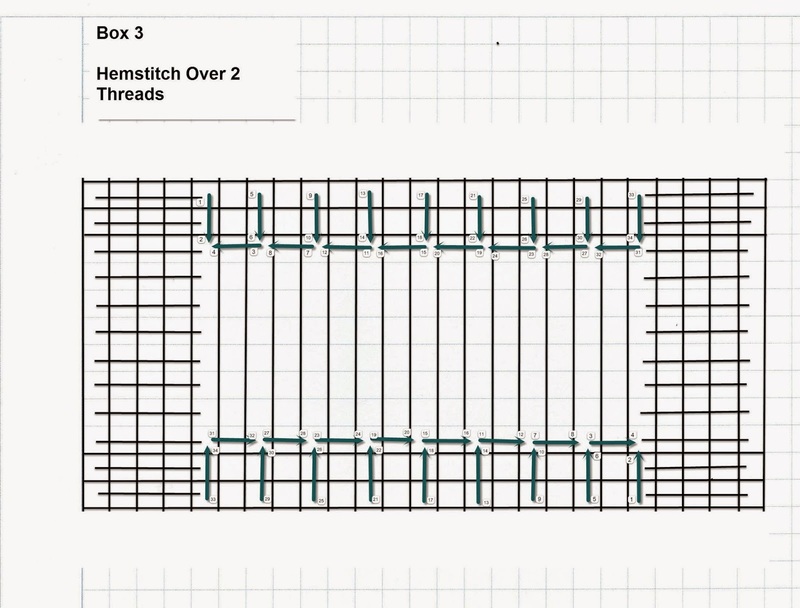 This is what Box 1 looks like after all the horizontal threads have been drawn or removed. 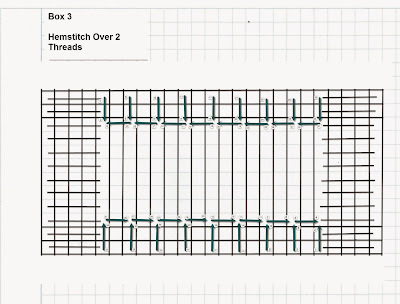 For Box 2, count down 2 horizontal canvas threads from the top basting stitches and clip 10 horizontal threads from both sides of the box, leaving 2 horizontal canvas threads above the basting stitches at the bottom. 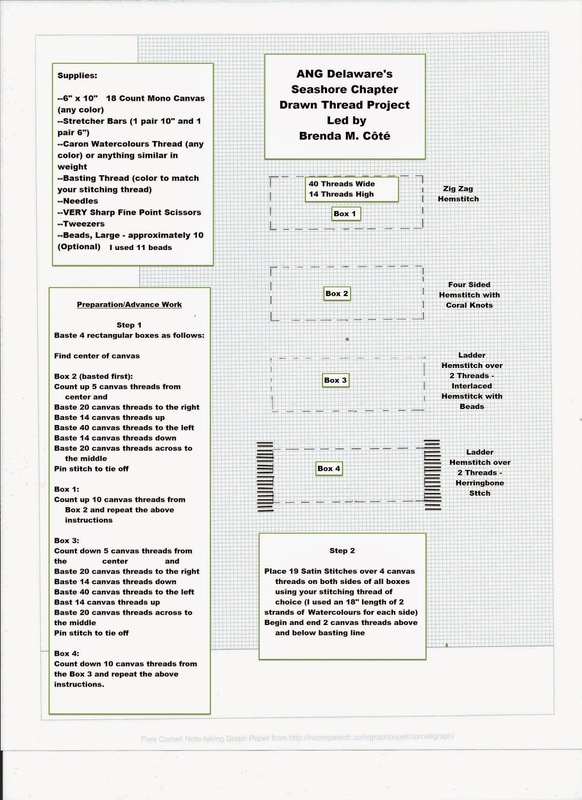 For Box 3, use the same instructions as for Box 1. For Box 4, clip 5 horizontal threads below the top basting line, then clip 5 horizontal threads above the bottom basting line on both sides of the box, leaving 4 horizontal threads in the middle of the box. 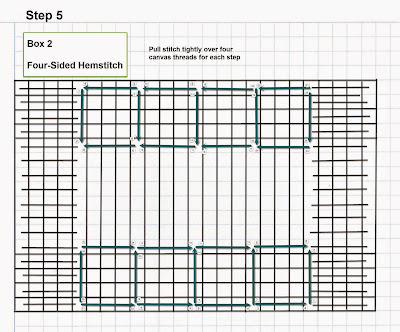 To stitch the Coral Knot, begin on the right side. 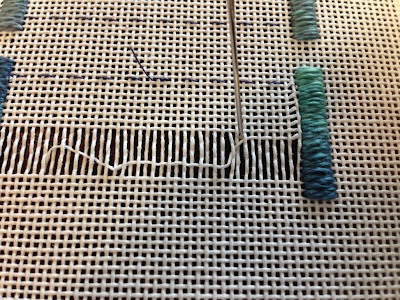 Insert needle under the first two vertical canvas threads, wrap your stitching thread around the needle (see second picture below) and pull the two vertical canvas threads over as far as possible to the left side. 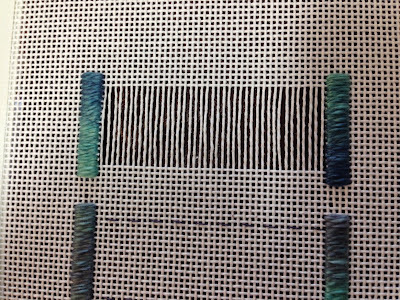 Next step is to again insert your needle under the next two vertical canvas threads as well as the two vertical canvas threads in the next group of four. Wrap your stitching thread around the needle (see second picture below) and pull. This will now form a cluster of four vertical threads (two from the previous group and two from the next group). 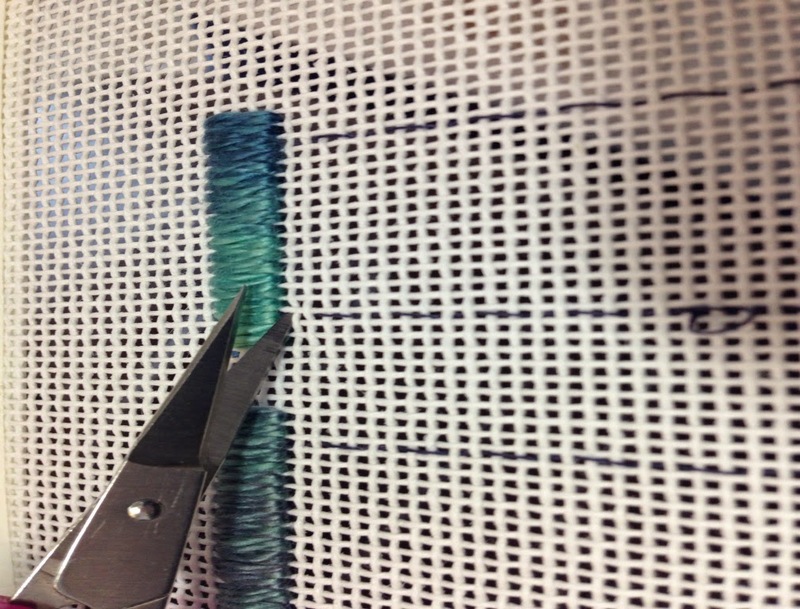 Begin stitching the Hemstitch on the left top side over two canvas threads. Stitch the bottom beginning on the right over two canvas threads. 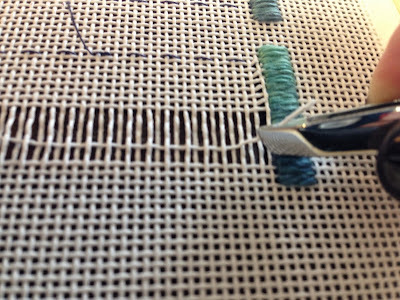 To add the beads, secure your stitching thread in the middle of the right side (under the satin stitches), slip a bead onto your stitching thread then insert your needle behind the next four vertical threads (forming a cluster). Then insert your needle up between the four vertical threads in the cluster (two vertical threads on each side), keeping your stitching thread above the needle. 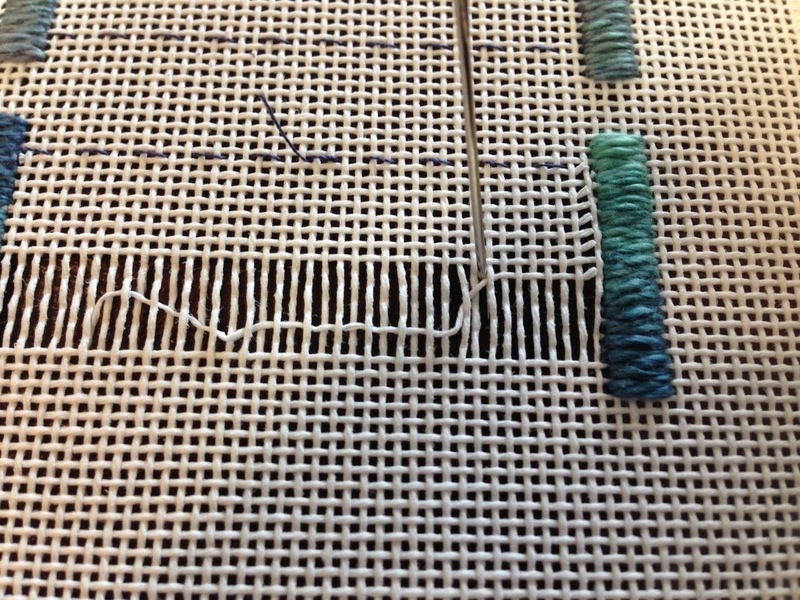 Now pull your stitching thread tightly, forcing the left two vertical threads to lie over the right two vertical threads as shown below. 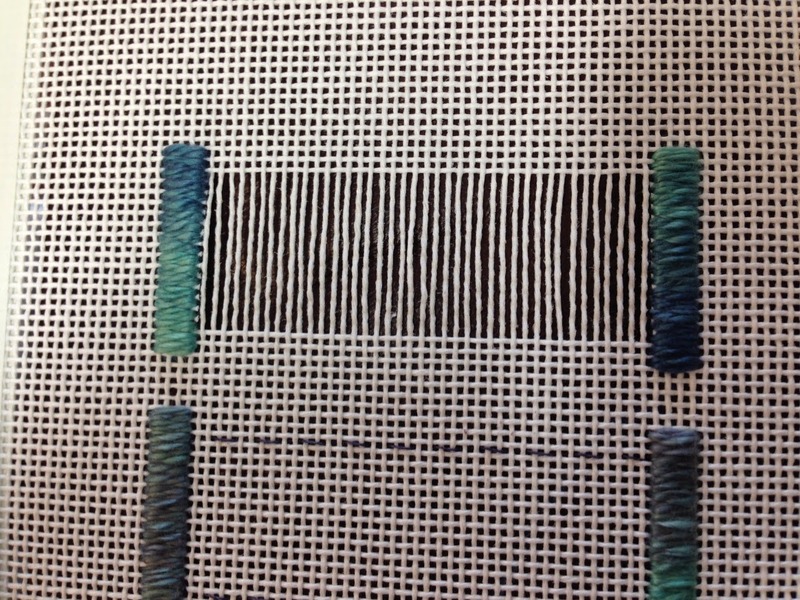 Continue adding beads and working the stitch until there are no more vertical canvas threads to wrap. Add a bead to the left side before anchoring your stitching thread to the back of the satin stitches. That's it. I hope these instructions were clear. I am not a teacher by profession and am not sure if I've over done it or didn't do enough instructions. 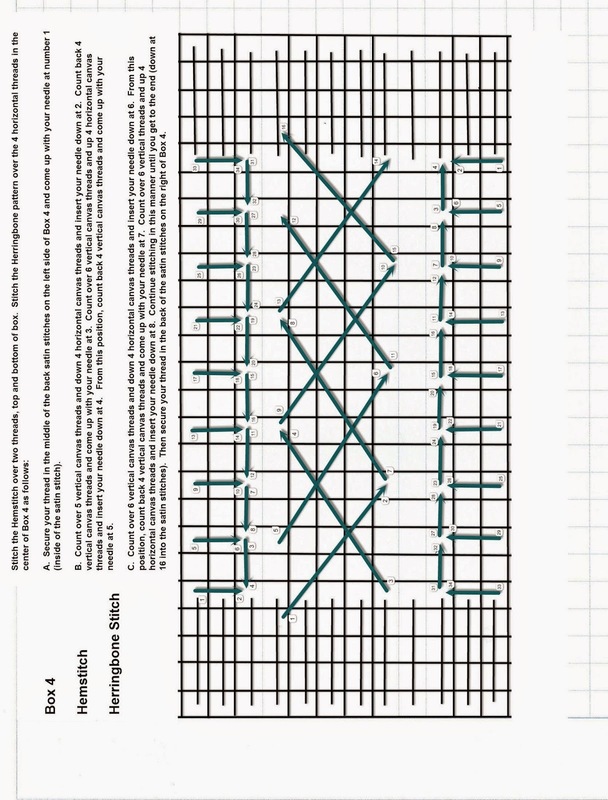 I want to reference the Beginner's Guide to Drawn Thread Embroidery by Patricia Bage as a wonderful resource for drawn thread work.